Chrysler was serious about NASCAR at the end of the 1960s. They were designing purpose-built specials to compete in NASCAR and win on the big ovals of Daytona and Talladega. 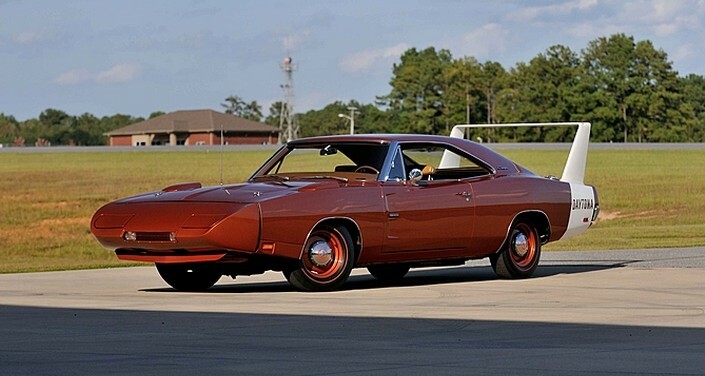 The Plymouth Superbird would come in 1970, but for ’69 there was the Charger Daytona, which was a modified Dodge Charger (specifically, the Charger 500 model). The changes were mostly aerodynamic: a pointed nose cone that was attached at the front to cut through the air and a 23-inch mega-spoiler out back. There were smaller trim bits as well and the standard engine was the 440 V-8. But this example has the Hemi option – a 425 horsepower 7.0-liter V-8. Only 503 Charger Daytonas were built and only 70 have a Hemi. This is the lowest-mileage Hemi Daytona known to exist, having only 6,435 original miles and was once part of the Otis Chandler Collection. It is an easy six-figure car. Click here for more info and here for more from Mecum in Kissimmee next January. This entry was posted in Uncategorized and tagged 1969, auctions, cars, charger, charger daytona, classic cars, daytone, dodge, hemi, mecum, muscle cars by classiccarweekly. Bookmark the permalink.